Since reading Carol Deppe’s book The Resilient Gardener, I’ve been thinking more about growing things that are staples rather than side dishes. This does not require that I change what I grow. I need to think in terms of putting my vegetables at the center of the plate rather than letting the “side dish” mentality sneak in. 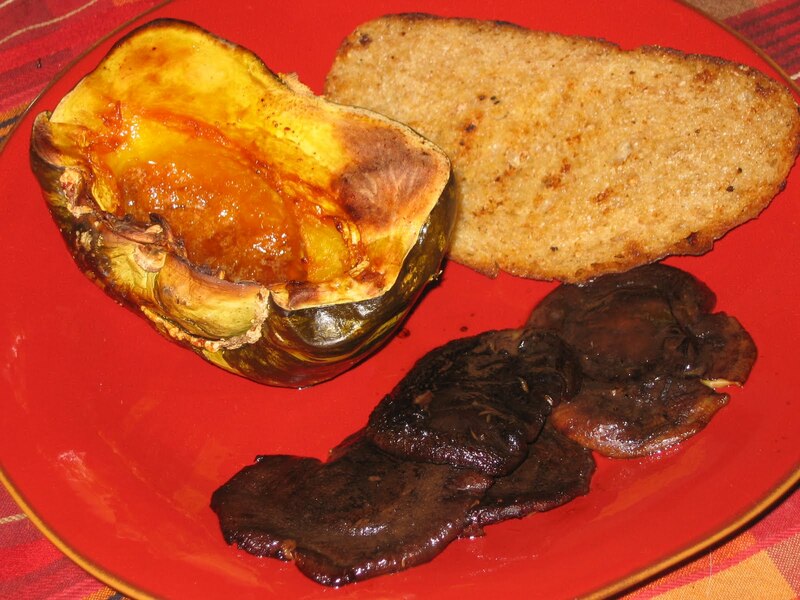 Winter squash is a filling, substantial staple and can easily be the centerpiece of a meal. In my opinion, roasting is by far the best way to bring out the flavor of squash. It keeps wonderfully in the refrigerator for a few days once roasted, and can also be mashed, packed tightly into containers, and frozen for later use. Once properly roasted, it can be made into ravioli or lasagna fillings, form the basis of hearty soups, or just be reheated later to eat out of the shell, so I roast plenty at a time. If roasting smaller squash, I cook several, so that the oven heat is efficiently utilized, or I put them on the bottom shelf of the oven when roasting something else. I love to put maple syrup or agave nectar, a pat of butter, and a pinch of salt in the cavity if I will be eating the squash straight, but if I might use it for something else like lasagna or ravioli or one of the impromptu dishes below, I just rub the cut surfaces with olive oil and salt before roasting. In the picture above, a roasted Kukuza half dominates the plate, with a few grilled mushrooms brushed with oil and soy for a meaty touch and a slice of grilled bread with olive oil and garlic. THis is a great substantial meal to share with vegetarians and vegans, or with nearly anyone. Here I cut a roasted squash half into thick slices, brushed lightly with soy sauce, chili oil, and roasted sesame oil, and broiled for a minute or two to accompany Asian flavors. 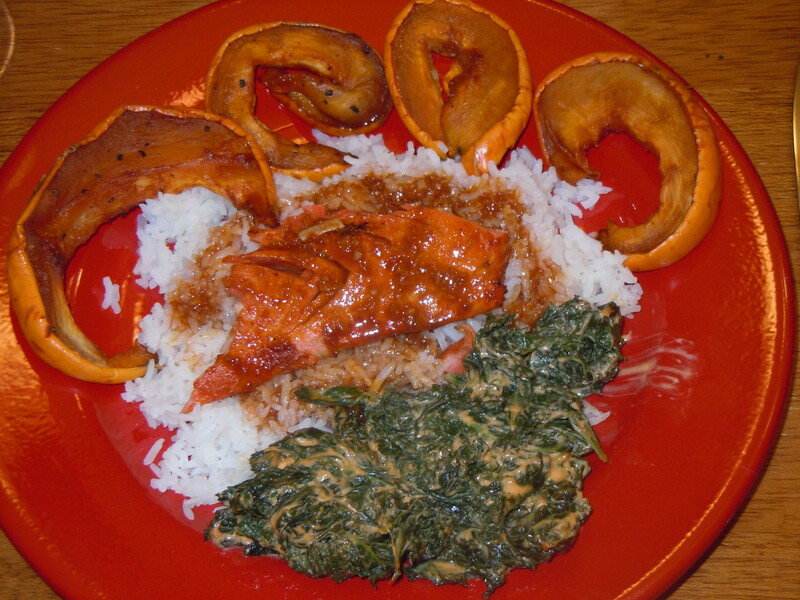 Here chunks of leftover roasted squash join a few chunks of leftover roasted salmon under a cheerfully colored Korean sauce. To make the sauce, chop up 2 cloves of garlic and a 1″ cube of peeled ginger. Heat a couple of tablespoons of oil in a small wok, and when the oil is hot throw in the chopped garlic and chile. As soon as the ginger fragrance comes up, about a minute, put in a tablespoon of gochujang and stir around madly for half a minute, then add half a cup of stock and 2-3 tablespoons of soy sauce. As soon as it comes to a boil, turn off the heat and add a teaspoon of dark sesame oil. Have ready a teaspoon of arrowroot dissolved in a tablespoon of water, and stir in. 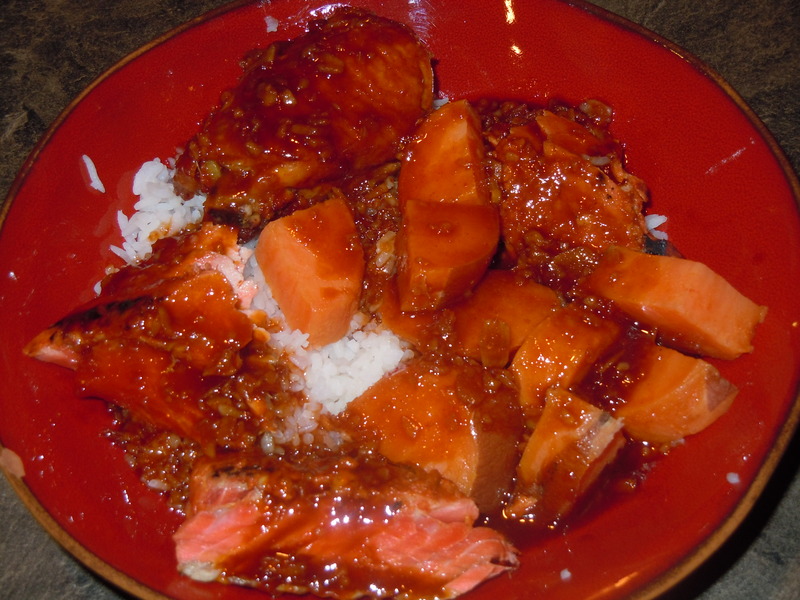 Let the sauce thicken briefly and serve over a bowl of rice topped with hot chunks of salmon and squash. If you are going to think of squash as one of your winter staples, you need to find a squash that you can grow well and that you really enjoy eating. A few posts ago, I wrote about the immense harvest of squash that I grew this year because I planted only Cucurbita moschata varieties, which love hot weather and are resistant to squash borers. C. moschata types need a hot summer to do well, and we can certainly provide that here (they are less esteemed in cooler parts of the country). All squash need curing before you eat them in order to taste their best. Needs vary among varieties. In general, I let all squash ripen on the vine and don’t pick it until a frost is expected. Then I set it on shelves to cure. It will cure faster in warmer ambient temperatures but will hold longer in cool places, so I keep some in the house, and some in my cool but nonfreezing garage to eat later. I give the smaller squashes three weeks to cure, and the bigger ones 8 weeks before I sample the first specimen. Even with the best treatment, squashes vary immensely in quality in flavor. My favorite C. moschata so far is a big turban-shaped beauty called Chiriman. It has moist but not watery flesh, no strings, and a lovely sweet-earthy flavor. The much smaller Kikuza is also delicious, and its small size may be preferable for some. Both are rather shy yielders, and Kikuza has rather thin flesh. Sucrine du berry yielded prolifically, and the flesh is very thick and is a dark and splendid orange-red, but the flavor is poor and the flesh is both stringy and watery, so most of the bounty is going to the chickens. I wrote to the seed company about my experience with it, and they sent back an excerpt from a gardening book explaining that winter squash needs to be vine-ripened and then cured for best flavor. Well, duh. Some squash just isn’t much good no matter how you raise it. If I ever get into hybridizing, though, I’m going to try some crosses of the prolific and bullet-proof Sucrine du berry with better-tasting C. moschatas. I still have splendid 20-lb specimens of Musque de Provence sitting around curing, but I won’t broach those until Christmas, so I’ll report on the flavor and texture after the holidays. I live in Boston, Massachusetts and am looking for a organic foods cook for my friend who lives in Albuquerque. She is a doctor with a busy schedule and needs help shopping and cooking. I love your website and thought you might have some suggestions. I can’t think of anyone offhand, but will keep it in mind. It might be worth advertising on the Albuquerque section of Craigslist, which reaches a big enough audience that a specialized request has a good chance of being answered. Good luck with your search.